Spinach quiche recipe is tasty and simple dish for Easter brunch or breakfast. Mini quiche is perfect for individual serving for Sunday brunch or to have a healthy breakfast. This crustless quiche looks beautiful, it is easy recipe you will want to make again and again! 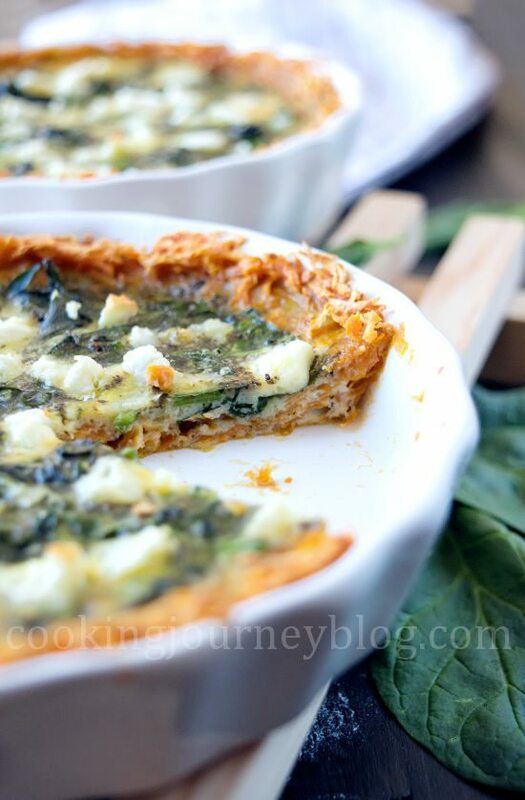 This time I’ve made spinach quiche recipe with feta and sweet potato crust. And it was so good, that next time for Sunday brunch sure I have to make more! If you are looking for crustless quiche recipe, you need to try it with sweet potato base. What’s great, there are only 50 calories in one mini sweet potato crust! I even don’t consider it is a crust, it is one of main ingredients here. 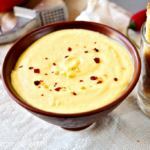 Sweet potato also adds gentle sweet flavor, awesome in combination with eggs and spinach. Moreover, it will nourish you with vitamin A, C and E, which are extremely important for eye health. 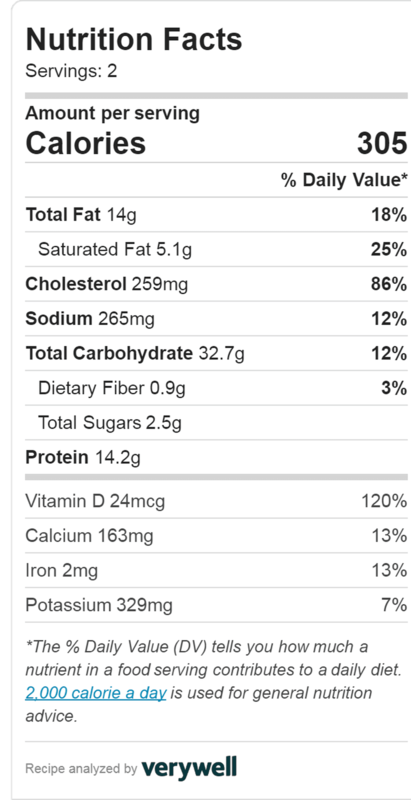 What’s also great, sweet potato are low on glycemic index and have a lot of fiber! 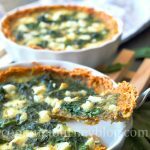 So this easy spinach quiche recipe, packed with sweet potato and spinach, which gives you more antioxidants and beta-carotine, is one of the best breakfast ideas. 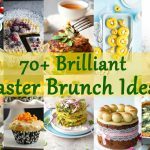 You may consider including it in your Easter brunch menu, because no one wants to skip the meal that is tasty and healthy! Quiche is usually made with basic crust, with different egg and cheese fillings. 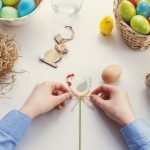 To make it easier and more healthy for you (and for us! ), I’ve grated a sweet potato (without skin) and pressed it to the bottom of the pan. Then bake your sweet potato crust, just to make it more firm and crunchy, not too soggy, when you have it with your filling. I have 2 small servings – 2 mini quiche, so I used only one small potato and only 3 eggs for the filling. Keep in mind that your filling will rise a little bit, so you don’t need to fill your pan till the top. Meanwhile prepare your filling. Beat eggs, add milk and spices. I really love to add cayenne and basil to my morning egg dishes! Of course pepper, but no salt, because later we will add feta cheese, which is quite salty already. Heat a pan with some olive oil. Add chopped spinach and toss few minutes until it shrinks. Then add few cloves of garlic and cook one minute more until aromatic. So your filling is almost done! Remove your sweet potato crust from the oven, but don’t turn it off. 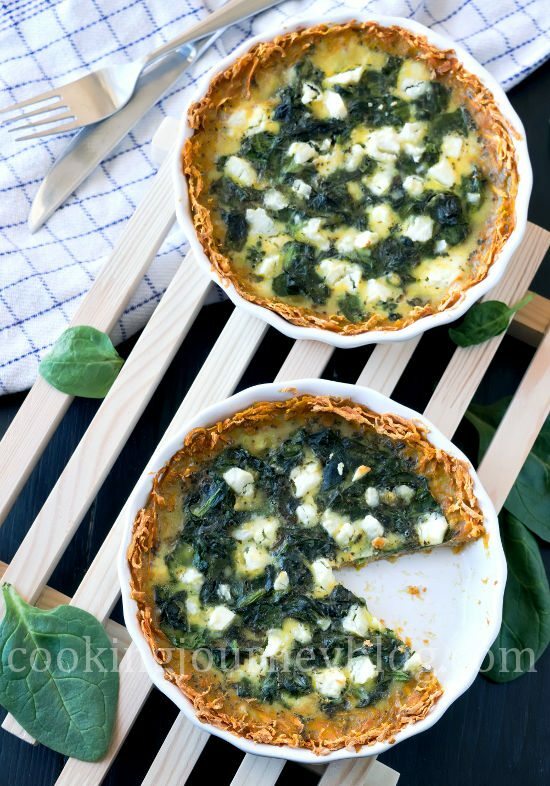 Distribute spinach to the quiche, fill with egg mixture and add crumble feta on top. Bake for about half an hour or more if you have bigger dish. Moreover, you can check if it is ready with a knife inserted – it should come out clean. Moreover, you can add cherry tomatoes, olives and bell pepper to the quiche. 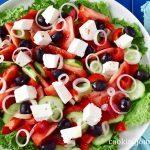 You can substitute feta to Parmesan, Mozzarella, Brie or other cheese that you prefer. 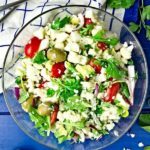 I love feta cheese so much that I add it to almost every dish, haha! 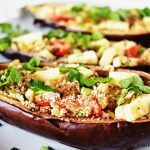 Check also our Stuffed peppers and Eggplant boats, if you love feta too! Quiche is a savory tart that is a part of French cuisine, named after Lorraine region in France. 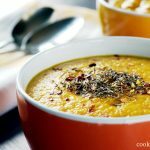 It usually have pastry crust, but sweet potato is a great gluten-free option! 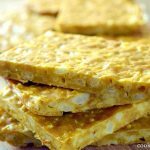 The main ingredients for the filling are eggs and milk, usually with cheese (quiche au fromage). I’ve made this vegetarian quiche with spinach, but it may also have seafood or bacon. I prefer serving quiche hot. 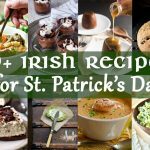 You can leave in in the fridge for up to 3 days and reheat in the oven for about 15 minutes. This quiche can be served for your family Easter brunch or breakfast. But it is also great party food, served cold. This easy quiche recipe makes 2 mini baking dishes (5,7 inch / 14,5 cm in diameter). However, you can double the ingredients to bake this quiche in a bigger tart pan. 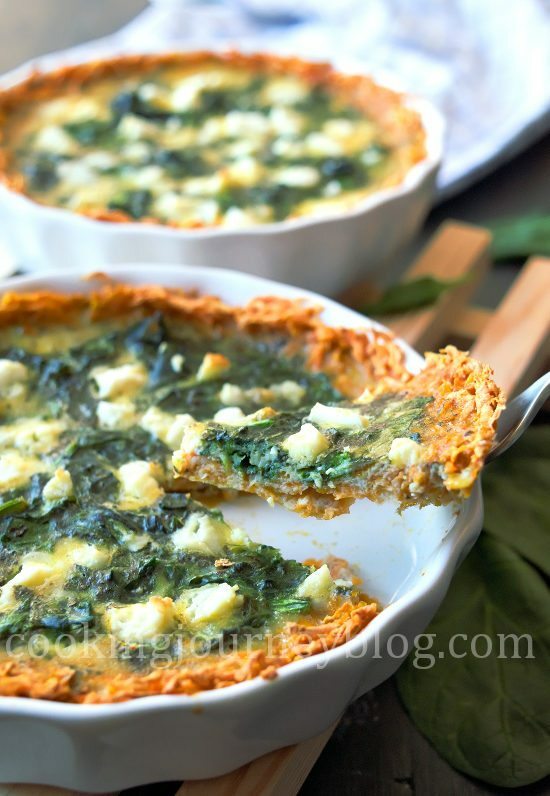 Hope you will enjoy this quiche florentine or spinach quiche! For more breakfast ideas, check our mini cauliflower casserole and Blackberry Ricotta pizza. If you make this easy quiche, share your thoughts on how you like it and rate this recipe! We appreciate your feedback! Spinach quiche is tasty and simple dish for Easter brunch or breakfast. Mini quiche is perfect for individual serving for Sunday brunch or to have a healthy breakfast. This crustless quiche looks beautiful, it is easy recipe you will want to make again and again! Peel sweet potato, grate it. Smear baking dishes with butter and press grated potato to the bottom and edges of the pan to make a crust. Bake sweet potato crust for 20 min. Meanwhile prepare your filling. Beat eggs, add milk and all spices. Heat a pan with some olive oil. Add chopped spinach and toss few minutes until it shrinks. Then add crushed cloves of garlic and cook one minute until aromatic. Remove sweet potato crust from the oven, but don’t turn it off. 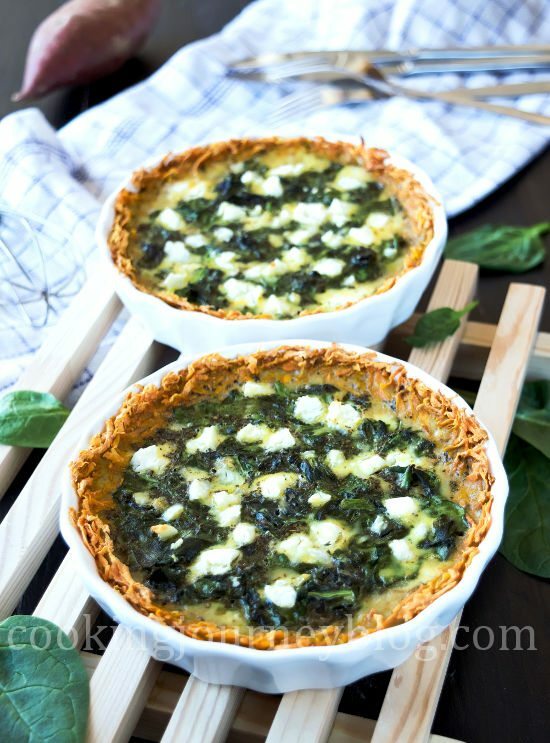 Distribute cooked spinach with garlic to the pans, fill with egg mixture and add crumble feta on top. Bake for about 30 minutes or more if you have a bigger dish. 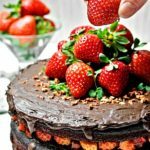 You can check if it is ready with a knife inserted – it should come out clean. This quiche recipe makes 2 mini baking dishes (5,7 inch / 14,5 cm in diameter). Thank you! It tastes great, too! Thank you, Albert! 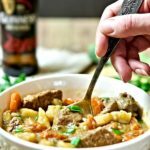 🙂 This is really amazing, hope you will try this recipe! I am making this over the weekend. I’ve been looking for gluten free crust options and sweet potato sounds awesome. And I love spinach quiche! What a great brunch option. Yum! This looks amazing and sweet potatoes must be incredible as the crust! 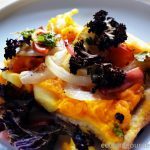 Yes, sweet potato crust is a great (if not the best) option for a quiche 🙂 We loved it, hope you will give this recipe a try! 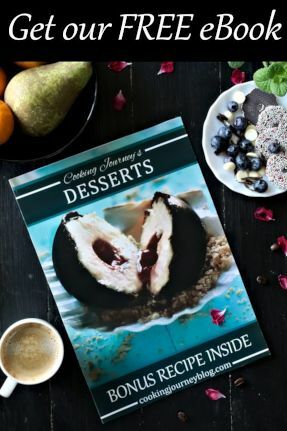 What a great idea for substituting pastry! Love feta here too, it just goes with so many things! 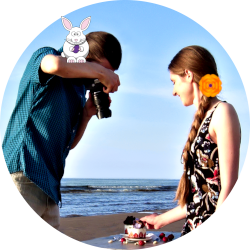 Your website is lovely by the way, so many great ideas ?